Here's the thing about The Trials of Shazam volume 1--it would actually be pretty good, if it were the Trials of, say, Son of Vulcan or something. 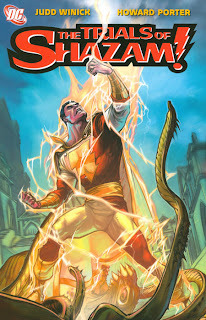 Trials of Shazam has great art, a likable protagonist, cool Lovecraft-type supernatural villains and monsters, and an interesting premise--but it just seems wrong for a Captain Marvel story. One year after Infinite Crisis, apparently Captain Marvel's been growing increasingly powerful, until his magical lightning transforms him into a new, older form. Now known only as Marvel, he takes the place of the deceased Wizard on the Rock of Eternity, and selects Freddie Freeman--Captain Marvel, Jr.--as his new champion. If Freddie can complete seven trials and earn his magical powers, he'll now be known as the hero Shazam. I'm slowly coming around to the belief that if the Captain Marvel character is going to work, Billy Batson has to be young--real young. Judd Winick's Superman/Shazam: First Thunder is a great example of how interesting Captain Marvel can be when Billy Batson is a baseball card-wielding child; Billy's awe at other heroes is a perfect counterpart to his powers as Captain Marvel. The Trials of Shazam ages the Marvel characters--if Freddie Freeman is going to college, Billy and Mary Batson have to be at least that old. At that point, I think the dichotomy between Billy and Captain Marvel falls away; a college age Billy Batson is old enough to make the decisions of Captain Marvel, and the irony that makes the character interesting falls away. Similarly, having Freddie Freeman take over as Captain Marvel--or as "Shazam," apparently, which helps get around a whole bunch of long-standing lawsuits--kind of defeats the purpose of Freddie Freeman. When Captain Marvel Jr. stands next to Captain Marvel, there's irony because they're both the same age but Marvel looks older. But when Freddie by himself turns from college age Freddie to college age Shazam, he's not much different than Blue Beetle or Robin--it's just another young guy in a cape. Obviously, Judd Winick and Dan Didio know they're taking some risks here. Trials of Shazam volume one is a perfectly interesting, readable comic--if you're a fan of urban magic, Harry Potter-type sorcery and the like, you'll probably enjoy this very much. Howard Porter's painting here, especially, contributes greatly to a strong mystical atmosphere for the story. And maybe if the whole of comics fandom rallied around the new Shazam, he might become a permanent entity. But it's kind of like Kurt Busiek's new Arthur Joseph Aquaman--I know he's not the real thing, you know he's not the real thing, and sooner or later they're going to have to bring the Big Red Cheese back--and then also retcon out the fact that the Marvel family was, for a time, old enough to go to college. 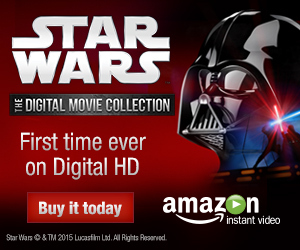 The continuity buff in me just feels like it's asking for trouble. Shadowpact review on the way. See you soon! Friday Night Fights: Boy Wonder! Friday Night Fights: Sixth Avenue Toothache!